Maddy finds it extremely distressing when anyone in our family is crying. “To make her laugh,” becomes her mantra as she sets about trying everything she can to make the person feel better. This could be considered surprising for a couple of reasons. 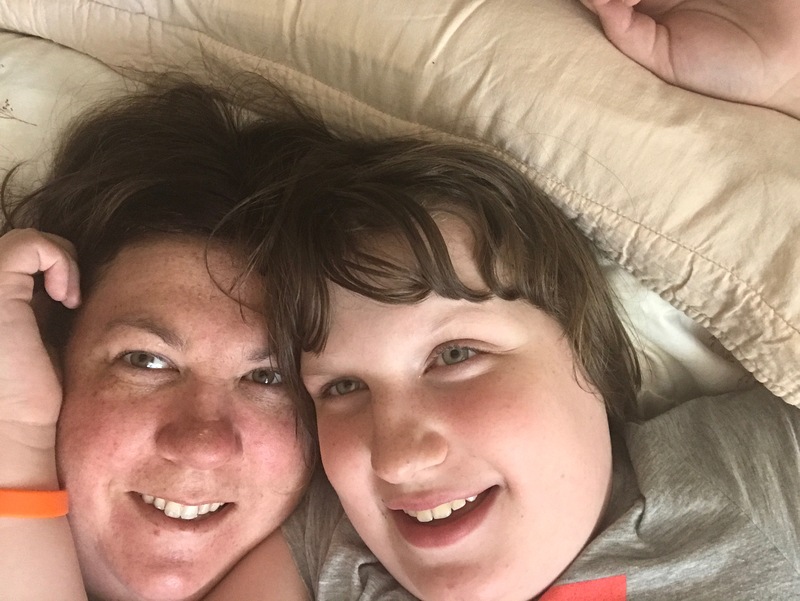 First there is that whole stereotype about about people with autism not being able to feel empathy. And at first I thought maybe that the great lengths that she will go to in order to try to cheer someone up were of a selfish motivation, reminiscent of the dark days of colic, when I would have given the twins anything they wanted if they just stopped crying, whether they felt better or not. Frankly I thought they were being overly dramatic, and if I’m being honest, a bit selfish. It’s like they didn’t care about my feelings at all! Babies really have some nerve. But Maddy is clearly more mature than I am because she rubs backs, wipes tears, and looks at me with pleading eyes, saying, “To make her laugh?” Over and over. She apparently missed that first year of her own life when it became quite clear that I have no power over the emotions in this house. She’s really sweet, and gives hugs (finally realizing that I am useless). And, okay, sometimes her squeezes turn to more of a choke, that feels like she’s acting out the, “Stop crying or I’ll give you something to cry about!” phrase of our own childhoods. And she likes to force glasses of water on the sad person, because nothing puts your problems in perspective like a good waterboarding! But I know that she really does care about our feelings, are really does want us to feel better. If it were the noise, she could just go in another room. Maybe rock in the corner with me. Anyway, there are options. The other reason that I am surprised that it bothers her when we cry is because she thinks crying babies are hilarious. And toddlers who fall down and cry are like a busker festival, sent purely for her entertainment. She does everything short of applaud, and yell “What time’s the second show?” Now, as far as I know, she doesn’t go out of her way to make babies and toddlers cry. Well except for her EA’s baby, who her other EA was holding when she came to visit. 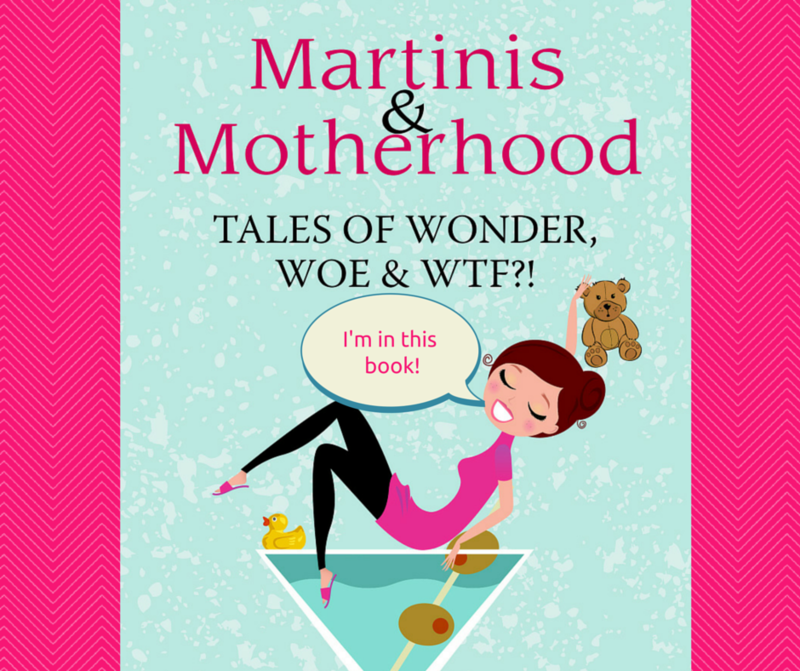 She crept right up to take a look, all sweet, and promptly roared in the baby’s face. But I’m just going to call that self-advocating for her one-to-one support. I can understand Maddy’s feelings about laughter being the cure for all problems though. And chips. We agree on that one strongly. I use comedy like medicine. My psychiatrist keeps telling me to focus on self-care lately, and to take lots of time for myself as I am swamped with caring for my mother, on top of my already stressful responsibilities. He keeps worrying that I am not doing that, and I have to reassure him that I excel at being lazy. You don’t need to tell me twice to sit down and relax. But I do stink at dealing with any time that my brain has to think too hard. I need to keep it busy, or else I end up crying into the dirty dishes or driving my blood pressure up with the swirling to do list in my head. That’s where Netflix on my iPad has been a lifesaver lately. I tote it around the house while I do chores, and watch it on Apple TV with my feet up when I am home for lunch. 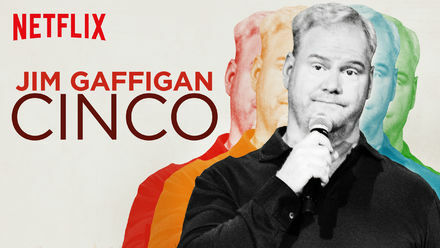 Cinco is Jim Gaffigan’s latest comedy special, and is the first one I watched of his. How did I not know about this guy? I am often reluctant to watch stand-up comedians because I don’t care for the raunchy, cheap humour that a lot of them resort to. I prefer clever jokes that I wouldn’t be embarrassed to be caught watching. Jim and his wife, writing partner Jeannie, have written jokes that are relatable as a parent and as a fellow lover of food and laziness. And Jim’s delivery of the thoughts of a complaining audience member is done with perfection. My stomach was killing me from laughing so hard at this special, and although I resent the sneaky ab workout, I am grateful for them making me laugh harder than I have in a very long time. Nerdguy and I are binge-watching the other four specials on Netflix, and it’s been really nice to have something funny to ease some of the tension that inevitably arises during stressful times between a couple. Humour and food have always been the way to both of our hearts. This is the first comedy special that I watched this month, and it was an awesome one to restore my faith in stand-up comedy. He’s a correspondent on The Daily Show, which is where some of the best smart comedians hone their craft, like Stephen Colbert and Samantha Bee, who I would hang posters of in my room if it weren’t creepy, and if the copy girl at Staples didn’t have so many condescending questions. I personally don’t think “What are you going to do with these? Why are there so many…are you wallpapering with them…is this you photoshopped in between them?” is any of her damn business. Calling the RCMP was just uncalled for. Anyway, sorry, where was I…is it hot in here? 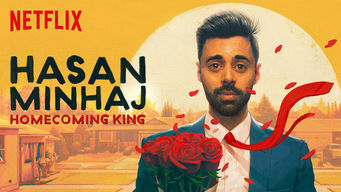 Hasan Minhaj has done a brilliant stand-up special that somehow manages to educate the audience on the experience of an immigrant in America, and being a child of an immigrant, in a way that is thought-provoking, touching, and still hilarious all at once. And he’s got charisma to spare. I’m going to need another poster. Next up I plan to watch Oh, Hello: On Broadway. Surprise surprise it’s got another Daily Show alumnus, John Mulaney, costarring with Nick Kroll. I’ll be doing my own comedy special, live from the court room where restraining orders are issued if I’m not careful. Are comedy specials part of your rotation on Netflix? What should I watch next? Disclosure: I am part of the Netflix Stream Team and I receive products, experiences, and a membership to allow me to tell the world exactly how much time I spend watching Netflix. Luckily they don’t make me disclose my ice cream consumption. I do that voluntarily.